From captivating wild and sea life to Alaska's world famous King salmon fishing; Alaska offers travelers endless adventures and scenic sites to explore. Petersburg, known as Little Norway, history dates back to over 100 years ago when it was founded by Norwegian anglers. Norwegian immigrant, Peter Buschmann, for whom the town is named, claimed this piece of paradise when he arrived on the north end of the island in late 1890s. Between 1890 and 1900 Peter constructed a dock, sawmill, and a cannery, which still exist in operation today. Each May Petersburg celebrates Norway's Constitution Day with the "Little Norway Festival." This celebration of Petersburg's Norwegian heritage is a huge festive event where visitors participate in traditional activities and dances or take photos with Vikings and Valkyries. Concerts, arts and crafts displays, smorgasbord meals, and leisurely boat tour are also highlights of the festival. Today, Petersburg is home port of Alaska Sea Adventures 60-ft. Expedition Yacht M/V Alaska Adventurer, specifically designed and constructed for use in Southeast Alaska. Alaska Sea Adventures specializes in creating custom excursion itineraries that include Sea-Kayaking, Fly Fishing for Steelhead & Silver Salmon, Fresh Water & Deep Sea Fishing, Whale Watching, Natural History, Archaeology, and Wildlife Photography. Explore ancient cave drawings, hike in vast rain forests, or stroll secluded beaches. Guests also experience the breath-taking moment when they catch site of the humpback whale and other unique wildlife native to the region. Alaska is home to the last undiscovered frontiers in North America. Archaeologists continue to discover evidence of the natives who once lived in this untouched region of the earth's largest temperate rain forest and America's largest National forest, the Tongass. Guides on the Alaska Sea Adventures take guests where no roads run to experience firsthand Alaska's natural history, geology, Native culture, and flora and fauna. The M/V Alaska Adventurer takes passengers into the heart of Alaska's varied inlets and secluded anchorages where large cruise ships cannot enter. The yacht accommodates only eight passengers per cruise in comfortable guest cabins for 7-day and 6-night cruises. Adding a personalized touch to the Alaska Sea Adventure is the gourmet chef and experienced deckhands whose knowledge of the Alaskan Wilderness enhances the exciting all-inclusive custom Alaskan voyage. 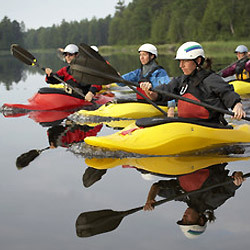 For information on reserving a memorable Alaskan cruise with Alaska Sea Adventures call 1-888-772-8588. From the Southern port of Ketchikan and along the SE Alaska Inside Passage, totemic art or Totem Poles are exhibited in galleries, museums, and towering among the trees. In Sitka, just North of Petersburg at the Sitka National Historic Park, is the largest such collection of totems in the United States at the visitor center and along the walking trails. When you're on the go & want to find exciting destinations to visit across the nation USA Travel Magazine also offers Wireless Coverage for our Mobile & PDA Readers. Bookmark our mobile page www.usatravelmagazine.com/m.html on your mobile device for easy access to travel destinations.